In the market for a sofa bed under £500? Let's start with the difference between a pricey sofa bed and a cheaper one – apart from price (of course). Well, the mechanism is different, but this could be a bonus: expensive sofa beds can actually be quite heavy to pull out, but value sofa beds have the ‘click-clack’ method, which means they tend to fold down at the back rather than have the under-the-seat, hidden option. And you can get them different sizes too – if you only need a spare bed for infrequent guests then consider a sofa bed chair instead. The good news is, you don’t necessarily have to compromise on style – as you can see from these 10 sofa beds under £500, there are some fabulous designs about. Want more? 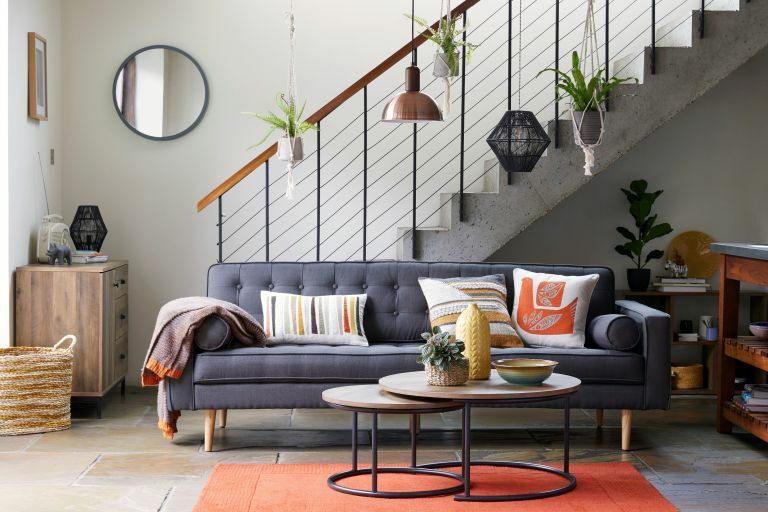 Read our guide to choosing a sofa bed that will and find more, modern sofa beds and traditional style sofa beds in our buyer's guides. This über modern sofa sits three and has a click-clack system that allows the back of it to flip all the way down and open up into a good sized bed. Size wise it’s the equivalent of a small double and has a supportive foam and fibre filling for added comfort. It comes in three colours – charcoal, black and white, and orange (shown). Kota three seater sofa bed, H90cm x W189cm x D102cm, £395, Habitat. This smart, contemporary style sofa bed has pale grey coloured upholstery that will ensure it immediately fits into any existing scheme. It has a lovely contrasting button detailing in the back and piping across the front edge. When you require it to be a bed, you simply fold down the back. Large Ethan sofa bed, H88cm x W195cm x D87cm, £399.99, Studio. The foam mattress that this modern look sofa bed comes with will give guests a comfy night’s sleep. Its slim frame also makes it a great option if you have a small living room (check out our room design gallery for inspiration). You simply fold down the backrest to convert it, then pop it back up the next morning. There are three other colourways to choose from; light beige; grey beige and anthracite. Nyhamn three seater sofa bed in green/blue, H90cm x W200cm x D97cm, £210, Ikea. Find more sofa beds for small living rooms in our buyer's guide. Instead of folding out backwards like some of the other value sofa beds, with this design the mattress is the back and seat cushions, which fold forwards to create the bed on the floor. If grey’s not your colour then you can pick quartz blue or quail beige. Eli Essentials two seater sofa bed in cygnet grey, H75cm x W142cm x D70cm, £299, Made. This smart design has three seating positions and a split back feature, so it can be configured to suit your needs at any given time. To turn it into a sofa bed you push the back rest back and it folds down flat. Colours available are putty (shown), teal and steel. The Basics Clapton sofa bed with foam mattress in putty, H76cm x W183cm x D88cm, £299, John Lewis. Looking to add some extra living room storage? The advantage of this design is that it has very handy storage underneath the seat, so you can keep the spare duvet, pillows and bedding neatly underneath when not in use. Friheten three seater sofa bed in dark grey, H83cm x W225cm x D105cm, £425, Ikea. With a steel grey cover and pale wood legs, this modern design has a Nordic touch. It has a three position click-clack backrest that converts the bed in seconds and a central armrest with cupholders and two removable cushion arms. Abernethy three seater sofa, H76cm x W181cm x D78cm, £299.99, Wayfair. Sometimes all you need is a single sofa bed that can act as a chair in a kid's room or in the corner of the living room. This handy one seater is big on comfort despite its size and all you do is pull the bottom out by its wheels to convert it in seconds. The Appley one seater sofa bed, H84cm x W82cm x D90cm, from £445, Willow & Hall. Love velvet sofas? You'll like this Baroque inspired sofa bed and the sumptuous colour range is to die for. Shown here is midnight grey velvet, but it also comes in seafoam blue velvet and vintage pink velvet. It has a quilted and scrolled backrest that is perfectly angled and you extend it back to sleep on. Slipper three seater sofa bed in midnight grey velvet, H82cm x W186cm x D84cm, £349, Made. Modern with a timeless element this design has the winning combination of good looks, style and practicality. It sits on wooden tapered legs which give it a sleek feel and it folds out to sleep two comfortably. Taylor three seater sofa bed in Pewter, H90cm x W208cm x D82cm, £359, Dunelm. Looking for more sofa bed advice?